The new smart meter rollout in the UK is marked by a national campaign, called The Campaign for a Smarter Britain, aimed at helping people understand smart meters, the national rollout and how to use their new meters to get gas and electricity under control. For this purpose, a series of adverts have been released, urging people to contact their energy supplier and have their free smart meter installed. 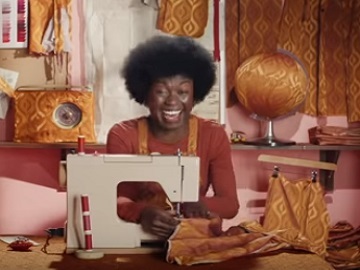 One of the most recent spots, titled “Save your energy for personal touches,” features Saskia, a woman who got a smart meter so she can save enough energy, every year, to power her sewing machine non-stop for 195 days. The ad shows how everything inside her house, including her boyfriend and cat, become, over the time, covered in golden pieces sewn by her at her sewing machine. At the end of the spot, the voiceover urges viewers to save their energy for personal touches and contact their energy supplier about getting their free smart meter. Smart meters are the new generation of gas and electricity meters coming with an in-home display screen that shows you exactly how much energy you’re using in pounds and pence, in near real time, how much energy was used in the last hour, week, and month (and what it cost), whether your electricity use is high, medium or low and will give updates in almost real time for electricity and every half hour for gas. Installed by energy suppliers in every household in England, Scotland, and Wales, they will bring an end to estimated bills, since they show a digital meter reading and automatically send the reading to your energy supplier at least once a month. Everyone will be offered the opportunity to upgrade to a smart meter by their energy supplier. Smart meters will be provided and fitted by your energy supplier, along with a handheld in-home display, at no extra cost.